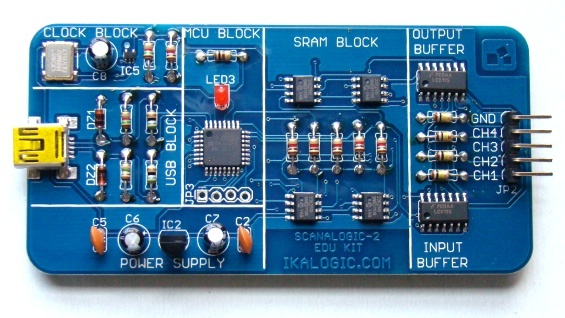 The picture below shows an assembled SCANALOGIC-2 board. It consists of six distinct blocks, marked by top silkscreen, that describes how a typical logic analyzer works. Power Supply Block provides stable and filtered 3.6V for the memory and I/O buffer chips. USB Block allows the voltage matching between the USB signal levels (3.3V) and the microcontroller’s 5V logic outputs. Clock Block provides a stable 20MHz clock for the operation of the microcontroller and for the signal sampling. 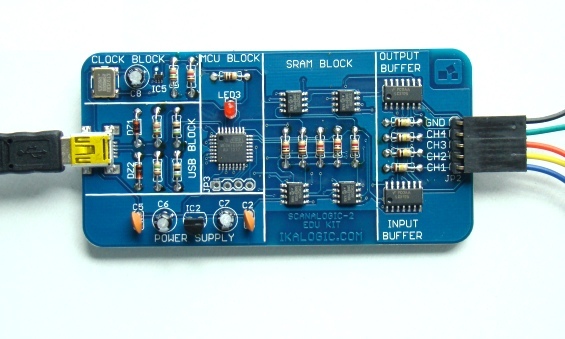 MCU Block contains the Atmega168 microcontroller, which is the heart of the device. It received the capture request from the host (PC) application, initializes the SRAM ICs, watches for trigger conditions and records the exact trigger position. It sends the captured samples to the host application for further analysis and visualization. SRAM Block holds the sampled data. There are 4 SRAMs, one for each channel. Each byte of data represents 8 consecutive samples, one for each bit. The logic samples are directly fed into the SRAMs, bypassing through the microcontroller, to achieve the maximum sampling frequency of 20 MHz. BUFFER Block isolates the outside world from the logic analyzer. 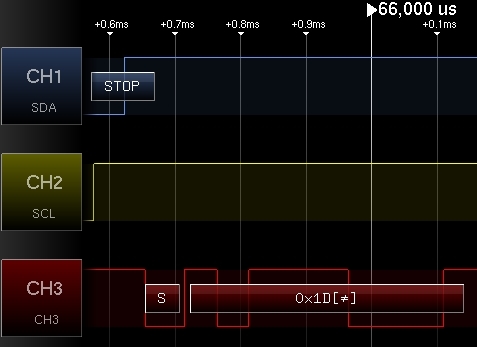 Besides, it also helps to interface a variety of logic levels from 2.0-5.0V. Now we will setup a very simple test circuit to see SCANALOGIC-2 in action. The test setup consists of the PIC12F683 microcontroller and TC74 temperature sensor. The communication with the TC74 device is accomplished via a 2-wire I2C compatible serial bus. 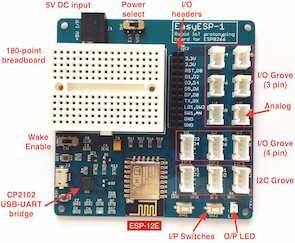 The PIC12F683 microcontroller is programmed to access the temperature reading from the TC74 device using I2C bus and send it out to its UART TX port. Channels 1 through 3 of SCANALOGIC-2 are connected to the I2C-SDA, I2C-SCL, and UART-TX signal lines, respectively, to monitor the data flow on these lines. The logic analyzer is connected to a PC that has the ScanaStudio software installed to visualize the captured data. Note that the SCANALOGIC-2 analyzer works in timing mode only. 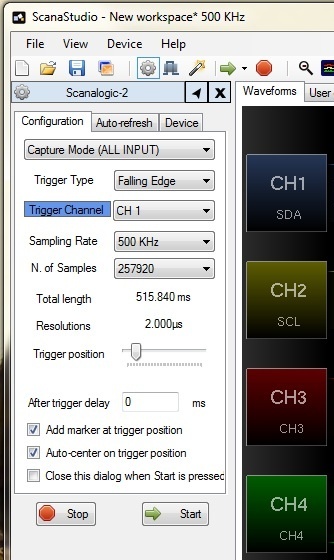 Scanastudio also allows to select Trigger Channel and Trigger Type before you capture data. In this case, I have setup Channel 1 as ‘Trigger Channel’, with ‘Trigger Type’ to be a Falling Edge, which means data capturing will start when a high-to-low falling pulse is detected on the I2C-SDA line, which could happen during an I2C Start signal. The sampling rate for the test case has been selected to be 500KHz , which is good enough to analyze the I2C communication (happening at 100 KHz) between PIC12F683 and TC74. The following picture is a Scanastudio snapshot visualizing the captured data on Channels 1 through 3. It is much easier to analyze the captured data if protocol decoder is enabled. 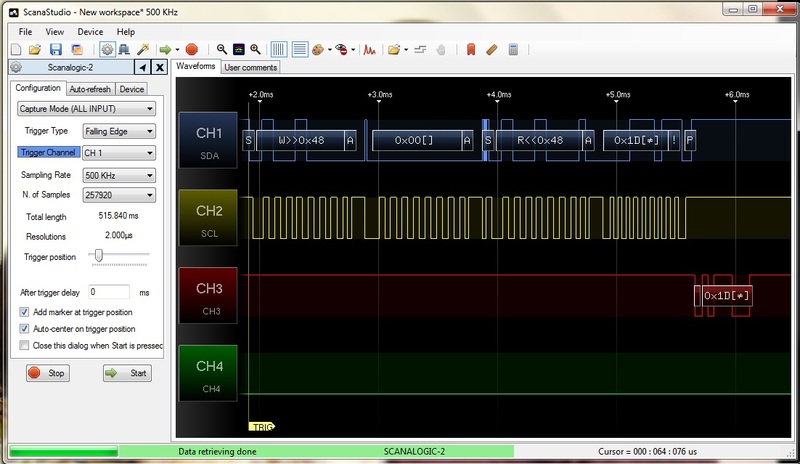 Scanastudio software can decode I2C, SPI, UART, and 1-Wire protocols. Read SCANALOGIC-2 manual for more detail on this. 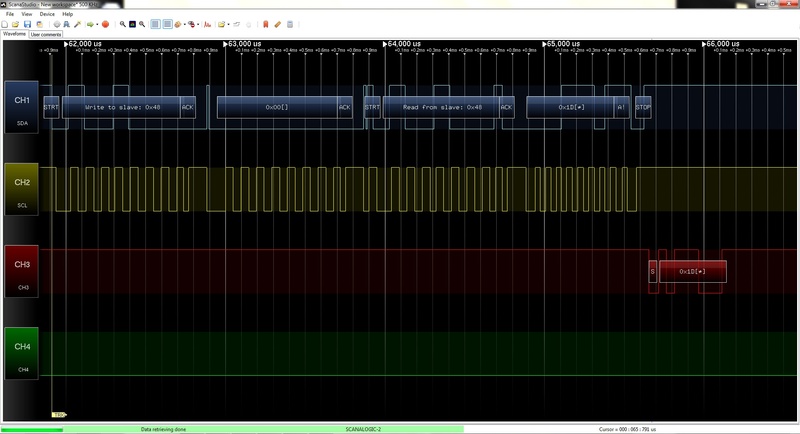 I have setup I2C protocol decoder (with 7-bit slave address, and R/W) on CH1 and CH2, and UART decoder on CH3. 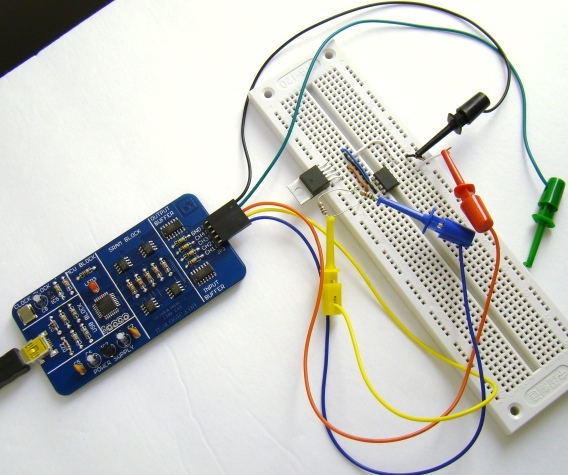 The host microcontroller issues a Start condition followed by the address byte. The address byte consists of the 7-bit slave address (0x48) and a Read/Write bit (R/W). The R/W bit is always ’0? (Write) in the first phase. If the received 7-bit address matches with its own address, the TC74 device responds with an acknowledge pulse. The host microcontroller next sends the command byte to TC74 to indicate which register it wants to access. For reading the temperature, the command byte should be 00h. The TC74 responds with an acknowledge pulse. The host microcontroller issues a new Start condition because the direction of data transfer is now going to be changed. The new address byte with R/W bit 1 is sent by the host, which is acknowledged by the slave. The TC74 transmits the 8-bit temperature data (°C) from the temperature register. Upon receiving the byte, the host doesn’t acknowledge, but generates a Stop condition. In the following pictures (screenshots of Scanastudio running on PC), you can see how the logic analyzer captures all these events happening on the I2C bus while the PIC12F683 microcontroller reads temperature from the TC74 device. PIC12F683 initiates communication with Start signal and then sends a 7-bit slave address (0x48) followed by a R/W bit 0 (Write). TC74 responds with an acknowledge pulse. Next, PIC12F683 sends temperature read command (0x00), which is also acknowledged by TC74. PIC12F683 issues a new Start condition with R/W bit set to 1 (Read). This is acknowledged by TC74. PIC12F683 receives a temperature byte from TC74, and sends a STOP signal without sending any acknowledgement pulse. The received byte is 0x1D (29 decimal) which corresponds to 29 °C. PIC12F683 sends out the received temperature byte (0x1D) on UART-TX line, which is hooked up to CH3 of SCANALOGIC-2. A brief overview of logic analyzer was presented in this tutorial along with a quick review of Ikalogic’s SCANALOGIC-2 EDU kit that allows you to build a simple and low-cost 4-channel logic analyzer at home. The SCANALOGIC-2 is based on ATMEL’s Atmega168 microcontroller and provides 20MHz sampling rate with 256K memory depth per channel. It uses the Scanastudio software on PC for visualizing the captured data. The software supports I2C, SPI, UART, and 1-wire protocol decoding on its four channels. The SCANALOGIC-2 channels also have got digital output capabilities that were not discussed here. You can refer the product manual to find more details on that. 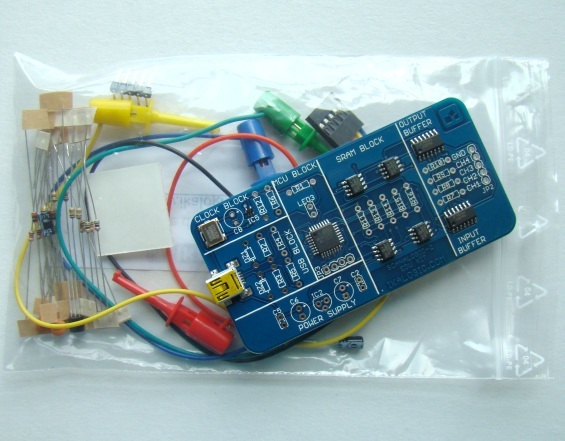 To sum up, SCANALOGIC-2 is a very simple and inexpensive logic analyzer kit that can come in very useful for beginners and hobbyists to analyze and debug serial interfaces between microcontroller and peripherals. It can also be used to generate PWM, Frequency Modulation, and UART signals for testing purpose. There is a plenty of room for further improvements too. IkaLogic should consider expanding the number of input channels, increasing memory depth, and implementing more trigger options. The basic defining characteristics of a logic analyzer are the number of input channels it can sample, the maximum sampling rate, and the memory depth for storing the samples.